The animals at River Bend Lodge roam freely which is a great drawcard to this malaria-free wildlife reserve, at the eastern end of South Africa's Garden Route. 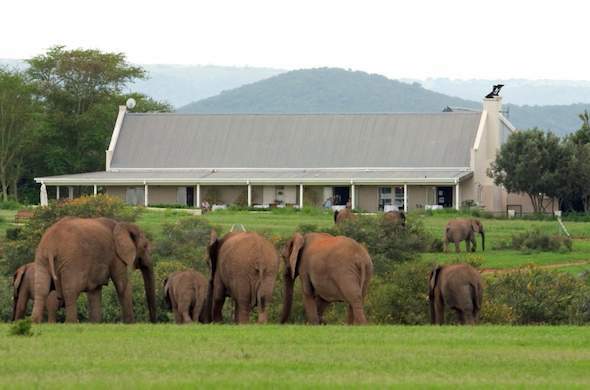 Since April 2003, River Bend has been incorporated into the Addo Elephant National Park, and a huge animal relocation programme has placed Africa's 'Big 5' in the 14 000 hectare concession. The focus at this Garden Route safari lodge is on relaxation and luxury, while offering game viewing opportunities. The elegant colonial-style lodge attracts the well travelled visitor looking for an intimate lodge with exceptional service, superior dining and unexpected luxuries. It is ideally suited to families. Owners Malcolm and Andrea Rutherford, are keen conservationists and by allowing their land to be incorporated into Greater Addo Elephant Park, they not only fulfill their conservation values, but assist in upliftment of the local community through job creation.